HP's Envy laptops may lack the distinctive styles that set them apart from the companies other consumer laptops but it still offers a solid experience for those looking at an all-around laptop. It features some strong performance that lets it do well in pretty much but it still isn't quite as suited for dedicated gaming as other laptops. The only other bit of disappointment was the storage which isn't quite as fast as ultrabooks with their dedicated SSD cache rather than hybrid solutions. 14.9" x 9.7" x 1.3" @ 5.7 lbs. HP's Envy lineup of computers used to offer a unique design experience from the traditional Pavilion lineup of computers. This has changed now with the Envy name meaning more about the features inside of the system than the design itself. It uses the same brushed aluminum lid and keyboard deck as past models but still has a plastic coated bottom that somewhat disrupts the overall feel of the system. It still is quite good just a bit diminished from what it once meant. Size and weight are fairly typical for a full-featured laptop at 1.3-inches thick and five and seven-tenths pounds. 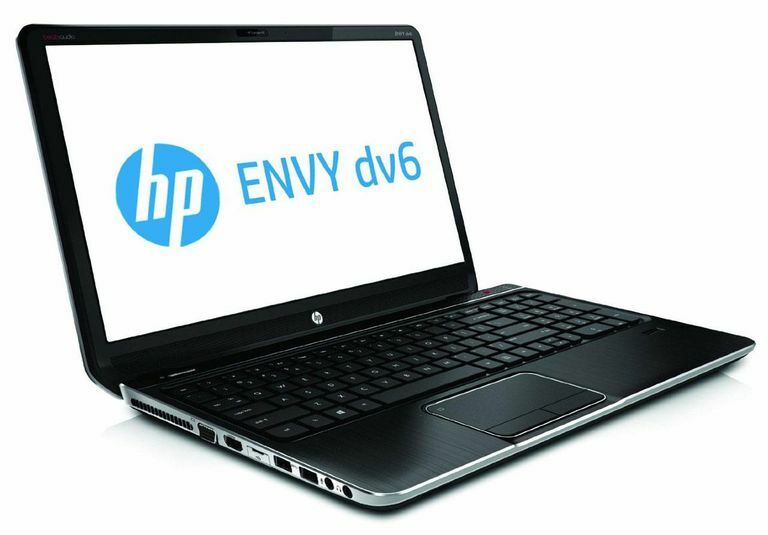 Powering the HP Envy dv6-7214nr is the quad-core Intel Core i7-3630QM processor. This is one of the higher of the latest Intel processor. Combined with the 8GB of DDR3 memory, it should have little trouble handling even the most demanding tasks such as desktop video or gaming. This is going to be overkill for those that just want a laptop for browsing the web, email, and productivity but the added performance means that the system won't likely be underpowered anytime soon. Storage features on the HP Envy dv6-7214nr is actually an interesting mix of technology. The primary storage is handled by a hybrid hard drive that has 750GB of storage from a hard drive that features 8GB of solid state memory on the drive for caching. This doesn't offer the same level of performance as most ultrabooks that use discrete hard drives with larger SSD drives for caching but it is an improvement. Boot times seem to benefit with Windows 8 coming up in roughly twenty-two seconds which is faster than most hard drives but slower than solid state drives. If you need additional storage, there are three USB 3.0 ports for use with high speed external. Media watchers will also be pleased that this features a Blu-ray capable drive for watching the high definition media format. It can also be used for playback and recording for CD or DVD media as well. The standout feature of the HP Envy dv6-7214nr is the display. The 15.6-inch display features a 1920x1080 resolution which provides a detailed display of the cost. Sure, it isn't quite as detailed or as nice as the Apple MacBook Pro 15 with Retina but that system also costs almost twice as much. Viewing angles are good as it the color making this well suited for those looking to do graphics work. Driving the graphics is the NVIDIA GeForce GT 650M graphics processor with an NVIDIA Optimus setup to share with the Intel HD Graphics 4000 when not needed. This gives it a good level of 3D performance such that it can be used for PC gaming but it will still struggle at times to run more demanding games at the full panel resolution. It does provide a good range of acceleration for non-3D applications such as the Photoshop. The keyboard layout has remained unchanged from their previous laptops. It uses an isolated key layout that features a full-size numeric keypad as well. It is nice to see that they have kept the large right shift and enter keys as well rather than scaling them down for special keys. It has a nice matte coating and solid feel that makes it very well suited for typing. The trackpad is a good size and is centered on the center of the standard keyboard section rather than the whole keyboard deck. It still uses integrated buttons which makes right and left clicks difficult at times. It does support multitouch gestures for Windows 8 and works well for the most part. It does have an issue with some of the gestures that require more than two fingers. HP uses a slightly larger 62WHr rated battery pack for the Envy dv6 compared to many others that rely on 48WHr. In digital video playback testing, this provides it with roughly three and three-quarter hours before going into standby mode. This is a bit better than most 15-inch laptops that feature 48WHr and average just under three and a half hours. It falls well short though of the Apple MacBook Pro 15 with Retina with its large 95WHr battery and seven hours of running time. In terms of the features, the closest competitors to the HP Envy dv6 are the Lenovo IdeaPad Y580 and the MSI GE60. Both of these laptops are similar in price and feature slightly slower quad-core i7 processors. The Lenovo offers a stronger graphics processor which is more useful for those looking to use the laptop for gaming but it is heavier at over six pounds and has some noise issues under load. The MSI unit offers nearly the same level of features minus a Blu-ray drive but with a casing that relies heavily on plastics that doesn't have the same level of feel as the HP.